The species is distributed in Caucasus and Transcaucasia. In Armenia it is found in South-eastern Armenia in two spots, at the Meghri and Bargushat Mountains, where the species inhabits sub-alpine grasslands at the elevations between 2,000 and 2500 m a.s.l. The first specimens were recorded in 1939 (but the species was discovered later in 1956), and then could not be found in the country until 2001, although special expeditions have been undertaken. The reason, why the expeditions failed, was non-accurate name of location at the labels of mounted specimens, which mislead the scientists, guiding them to Zangezur Mountains. In 2001 the species was eventually discovered at Meghri Mountains and later - in 2017, also at Bargushat Mountains. The investigations of species biology, which stated after that determined the larval host plant, which is Astragalus prilipkoanus​. The females do not leave the core habitat inhabited by host plants, while the males can fly over one kilometer to find the watering place. 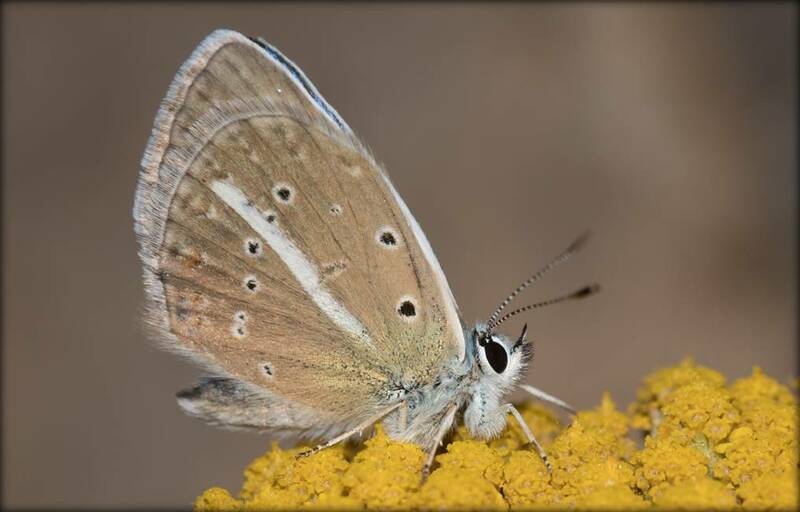 This is one of the latest blue butterflies in Armenia, which begins its flight in late July - early August, and are on wing until mid (sometimes late) August. The species is rare within typical habitat. The data collected between 2003 and 2013 in Meghri Mountains, suggests stable population trend, which is most probably result of hardly accessible and rather steep habitats of the species, which are not heavily grazed. Unlike that site, the species' habitats at Bargushat Mountains feel the load of grazing and therefore, for conclusion on the species, there is a need of additional investigations at second site. In addition, it is important to mention that the entire South-eastern Armenia is a subject of metal mining, operated in the open-pit mode. Therefore potentially the habitats are under danger of destruction if such a decision takes place, which is crucial for this highly specialized species with restricted distribution. Also it should be mentioned that although there is some demand for the species for collections, the trade of the species is not seeming to have a regular and intensive character. The species is not included in the Global, National, and European Red Lists. ﻿﻿​​Also it is not included in CITES and Bern conventions. Preliminary assessment of the species' conservation status suggests it as Near Threatened. At current none of the populations are covered by Protected Areas of Armenia or existing Emerald Sites. However its distribution is covered by potential Prime Butterfly Area Pkhrout, which is under assessment at current. 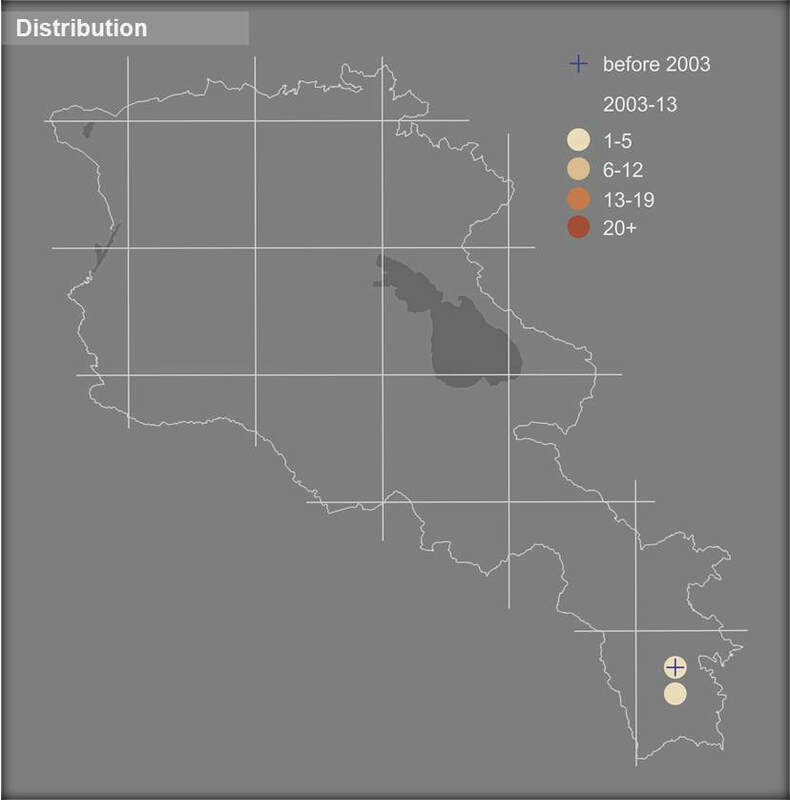 The proposed conservation measures include: (1) to study the second population of the species for proper assessment of the species' conservation status; (2) to finalize assessment of the PBA Pkhrout, and to consider the second site of the species as potential PBA; (3) to include the areas of the species' distribution into existing networks of Protected Areas of Armenia and Emerald Sites.